illustrious father Late Gouranga Bharati Thakur who happens to be the brother of Paramhansa Narayan Thakur son of famous Tantrik Baroda Kanta Bachaspati of Manasabari in Kotalipara, village Ratal, Faridpur district of present Bangladesh. 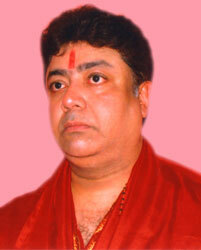 Goutam Bharati, F.R.A.S. (London) successor of 350 years old 'Mother worshipper' family. Goutam Bharati is a sure success in Mahanabagraha (Super Planetary Positions), Mahamahoushadhi, Yantram-sarbobijoy, Tripad dosha, honour and subjugating enemies. Satima Yantram Karma, Debighat, Dakshinabarta Shankha Business, Dhanada Yantre Dhanalava, Bastudoshe Bastu Yantram, Mritabatsya - for bearing children, Prajapati Yantram - for Marriage, Bhouma & Kalsarpadoshe Bagala, Kalsharpa Yantram, for problem in Love life & marriage life, Photograph mesmerism - to gain control over enemies and libertine relatives, Maha mrityunjoy - for unforseen and impending dangers, For education - 'Saraswati Yantram', 'Dashamahavidya' - for fulfillment of wishes, desires and faulty planetary positions, 'Janhabhi Yantram' - for desease in brain, In special cases if Goutam Bharati feels, gives more than one Yantram together simutaneously to a deserving candidate. If required he gives 100% pure G.S.I. gems. Every Evening - 4 to 6 p.m.
Sunday Morning - 8 to 11 a.m.